With less than a week to go, the election fever in India is raging. The main Opposition party, Congress, has fielded its prime minister candidate, Rahul Gandhi, from two constituencies. He would stand from Amethi, a traditional Nehru-Gandhi bastion in Uttar Pradesh, in North India. And he would contest from Wayanad, a northern forest district in Kerala, India’s southernmost state. The choice of the second constituency in Kerala is pregnant with implications. Unlike Amethi, which is a small town with a population of a little over 12,000 dominated by Hindus and a literacy level of a little over 50 per cent, Wayanad is a relatively large district, and relatively prosperous with a literacy level of over 80 per cent despite the fact that it is a tribal belt. Nearly 30 per cent of the population are natives of the hills, whose indigenous lifestyle and traditions were overrun by an influx of industrious Christians from southern and central Kerala in the second half of the last century. While this demographic movement contributed to the large-scale conversion of the hilly area into farmland, paddy fields and cash crops, the natives found themselves marginalised, and to a considerable extent dispossessed of their land. In the last few years, thanks to the affirmative policies of the state government and the selfless work of several voluntary organisations, the tribals are a little better off. Christians are the dominant community in Wayanad in population and political clout. Gandhi will win in both constituencies. While Amethi goes to polls in the first week of May, Wayanad will line up at the booths in the third week of April. The Indian elections are a seven-phase event. One of the reasons for choosing Wayanad is that it gives Gandhi enough time to recoup from his North Indian battles and campaign for his newly adopted constituency. Calendar-wise it makes sense. In a recent speech, the ruling BJP prime minister, Narendra Modi, riled Gandhi for running away from North to South. He said Gandhi was not sure of winning from Amethi, as Uttar Pradesh in general is the Hindu heartland. Incidentally, the chief minister of Uttar Pradesh is Yogi Adityanath, a Hindutva leader not known for his moderation. Modi said Gandhi has fled to Wayanad because he does not represent the majority community’s interest. This may be easily interpreted as a low blow. Christians and Muslims may be minorities. But they are Indians. Nevertheless, the sectarian spin that Modi imparted to Gandhi’s Wayanad move may actually have a positive aspect as far as Gandhi is concerned. It gives him a bonafide certificate in secular politics. 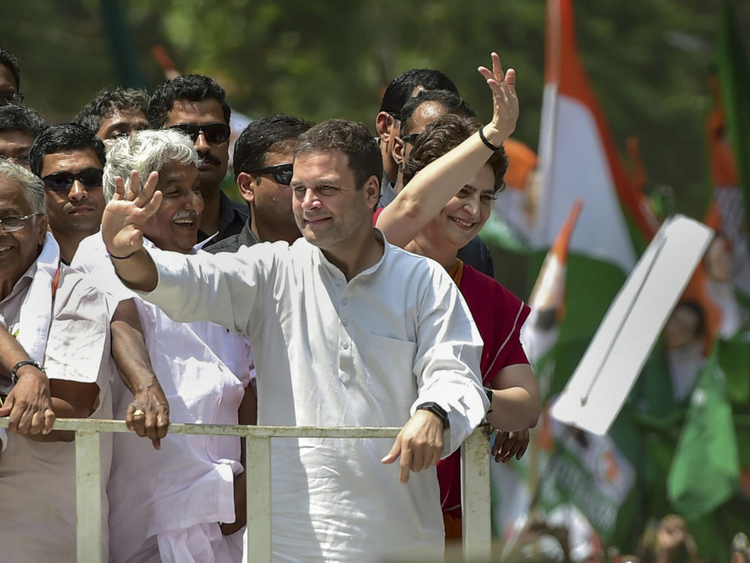 That he represents the minorities (Wayanad) and the majority community (Amethi) lends him a pan-India appeal and should help him and his party mobilise the Muslim votes across the country. It is a forgone conclusion really that he will win his Kerala seat. If so, it will be for the first time that Kerala will have its case represented in Delhi by a candidate of potentially prime ministerial stature. A.K. Antony, a veteran Congress leader and a minder of the Gandhi family, is the chief architect of Gandhi’s Kerala designs. As of last week, Modi is on the back foot. Towards the end of February, following the Pulwama incident in Kashmir when a suicide bomber killed 49 Indian soldiers and the much-publicised surgical strike by the Indian Air Force across the border into Pakistan, Modi’s ratings had briefly shot up. With the Pakistan Prime Minister Imran Khan releasing a captured Indian Air Force pilot, Modi lost the moral high ground. This was followed by claims and counter claims of the casualties that Indian forces inflicted. India had initially said nearly 300 Pakistan lives had been lost in the attack, a claim they were eventually unable to back with evidence. The latest bizarre development in this phantom war relates to an F16 jet which Pakistan sourced from the US. It turns out the jet has not been shot down as claimed by India. Apparently, concerned US officials took a count, and found no missing plane. But the very next day, it was reported that no such count took place, according to the Pentagon. Earlier in these columns I had mentioned how in this age of surveillance, information has become one of the most opaque of commodities. Ironically, no one is more materially affected by it than Modi. This uncertainty of affairs — did an event transpire, or not?— has been taken advantage of by Gandhi and his party, and extended to other areas of politics. Almost every claim that Modi is making — employment generation, start-ups, industrial and agricultural figures — has been contested, affecting Modi’s credibility severely. So much so, last week Modi invited a popular vernacular TV channel to his office to tell them that they are biased in favour of Gandhi. The short of it is that Modi no longer looks the unbeatable, great, bearded Hindu hope that he was in 2014. But the Indian voter is a canny thing. She often surprises herself.